Are Separate Birthday Parties Necessary After Divorce? Do You Need Separate Birthday Parties After Divorce? Most children excitedly look forward to their birthday, with visions of being surrounded by friends and family, presents, and cake. While parents generally do everything they can to make their child's day special, divorced parents have the extra burden of figuring out how to handle the festivities. Will there be two separate birthday parties or will you have just one? The following article provides some tips to help you keep the drama out of the celebration. Should You Allow Your Ex to Be at Your Child’s Birthday? By Patrick A. Wright, J.D. For most children, celebrating a birthday is one of the most exciting events of the entire year. After a divorce, your child may feel sad, vulnerable or confused because things aren’t the same as they used to be. You know it’s important to continue the tradition of making each birthday celebration special and memorable, but should you include your ex in the celebration? One of the biggest factors in making this decision is the type of relationship you have with your ex. If you’re able to be civil around each other and co-parent without tension or hostility, there’s no reason that you can’t both be present at your child’s birthday party. But if you have custody of your child and have a strained or volatile relationship with your ex, you may have to take the time to think about whether having your ex attend your party would make your child’s birthday complete or ruin their day altogether. Should You Invite Your Ex or Not? It’s important to remember that you are human. If your divorce is very recent and is still causing you intense pain, you might have a hard time holding it together if your ex is there no matter how much you want to. This is especially true if your ex has moved on to new relationships but you aren’t ready to do the same. The last thing you want to do is spend your child’s birthday worrying about how your ex drives you crazy or trying to pretend you’re fine when you’re not. When couples split up, they typically have had a lot of practice at pushing each other’s buttons. While intellectually you know your relationship is over and you’re better off apart, you may still have some painful emotions beneath the surface. If your split was amicable, you and your ex may be able to co-parent with maturity and grace. If enough time has passed since your divorce or if you and your ex were both ready to move on at the same time, you may be able to set aside your own feelings for your child for one day. If you’re both able to do this, your child will be able to have a great birthday without dwelling on the things that have changed. Each situation is different, and it’s important for you and your ex to be honest with yourselves and each other. Can you treat each other with respect? 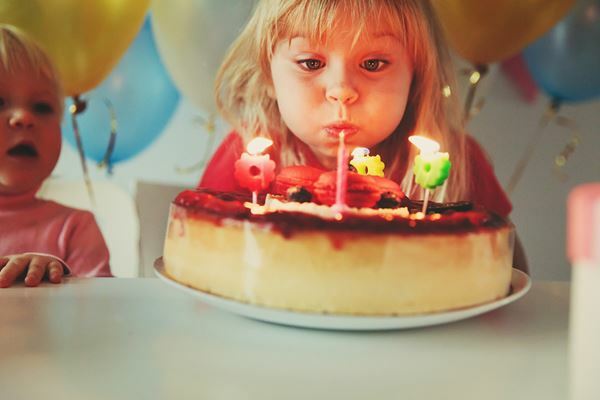 If it’s too soon after your divorce and emotions on both sides are raw, the best solution may be to celebrate your with separate birthday parties for your child. Some divorces are much more difficult than others; if yours is one of these, you may not be able to work things out with your ex without the help of an expert in the field of divorce and family law. Experienced attorneys should be able to help. If your current child custody agreement isn’t working, you can go to court to have it amended as well. Doing your due diligence ahead of time will ensure that your child can continue to enjoy their birthday every year. About the Author - Patrick Wright is co-founder and Managing Partner of The Wright Firm, LLP. Patrick is Texas Board Certified Family Law attorney and has dedicated his career to resolving the conflicts that pull families apart. Whether you have one big bash or two separate birthday parties, make the most of their special day. Ultimately, what children want is to share special occasions with the people they love without feeling pressured to choose. Are Separate Birthday Parties Necessary?